Accomodation: For general information and links to various types of accomodation check here. If cost is not an issue, check Hotel International which is located 200 metres from the convention site. If you are on a budget, there are several hostels in the vicinity, or you can see what’s offered on Airbnb. 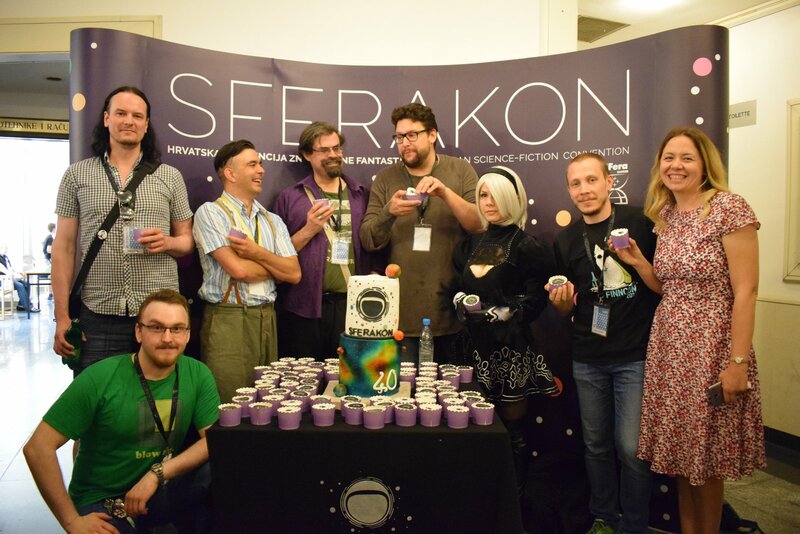 SFeraKon is the longest-running and so far the most popular Croatian SF convention. The first one was held in 1983, and in 1986 and 2012 it hosted a Eurocon. It is organized by SFera, the Zagreb SF society. Usually over 2000 attendees and visitors pass through the halls during the convention. We had Guests of Honor such as Frederic Paul, Sam J. Lundval, Harry Harrison, Joe Haldeman, George R. R. Martin, Robert Silverberg, Martin Easterbrook, Guy Gavriel Kay, Walter Jon Wiliams, R. Scott Bakker, Lois McMaster Bujold, Tim Powers and eagerly await many, many more. The same goes for plain mortals – if you have nothing to do in the middle of May, come and meet us. If you have other engagements, cancel them and come and meet us.